♫ 1BA+1DD Driver, entry level hybrid earphone, 8mm dynamic driver and new upgrade balanced armature driver. ♫ Hybrid dual driver, provide you a balanced sound. ♫ Metal Shell, provides you a more fashionable accessories for music player or smart devices. ♫ Detachable 2 pin cable, gold plated pin, durable and easy for you to change other upgrade cable or bluetooth cable. ✪ KINBOOFI have the Formal authorization from KZ company , all products are original. ✪ KINBOOFI offer 12 months warranty from the date of purchase if you purchase from KINBOOFI. ✪ Feel free to contact us if you have any questions, we will reply you within 24 hours and give you a satisfied solution soon. 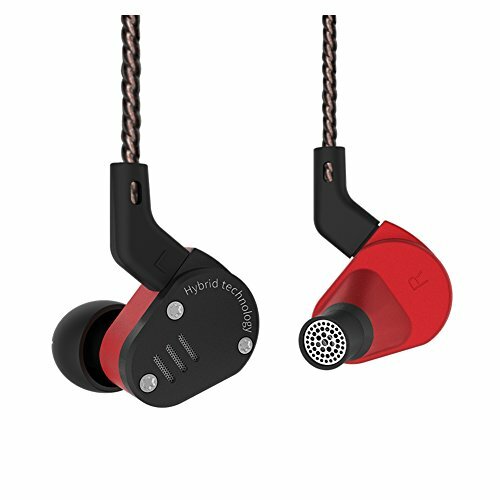 【1BA+1DD HIFI KZ Headphone】The KZ ZSA in ear monitor headphone has 1 Balanced armature and 1 dynamic hybrid driver, Performance sound is more clear and detailed than single or dual dynamic driver headset. 8mm dynamic driver response for low and mid range, new upgrade armature response for the mid & high range. 【CNC Aluminum Alloy Metal Shell】 High-end CNC Aluminum Alloy Metal Shell on this KZ ZSA Earphone, more fashionable and durable than plastic shell. Having two color shell for you to choose, the gray color and black color. 【Detachable 2 Pin Cable & Memory Wire Ear Hook】This KZ ZSA earphones has the detachable 2 pin cable, with gold plated pins,and 3.5mm audio connector, 0.75mm standard pin diameter. Using memory wire ear hook on this ZSA headphone in ear monitor, easy for you change the shape of the cable and let them suit your ear well. 【12 MONTHS WARRANTY】 Buy With Confidence. KINBOOFI has the authorization from KZ company, all of our product are original. You will get a 12 months warranty from the date of purchase if you order from KINBOOFI. If you have any questions about this product by KINBOOFI, contact us by completing and submitting the form below. If you are looking for a specif part number, please include it with your message.